On cool spring or autumn evenings, just after dusk, nightcrawlers will emerge from their burrows to rest on the surface of the soil and seek mates. This is the best time for catching nightcrawlers. These prolific creatures can often be collected by the thousands on a good night in some areas. Nightcrawlers are relatively easy to catch and can be kept alive for weeks to be used as fishing bait. One of the best times to hunt for nightcrawlers is in the evening after a good rainfall. Rain during the day will saturate the soil and help drive nightcrawlers to the surface at night. If there is no rain, try simulating rainfall by watering the ground well where you will be hunting just before sunset. Nightcrawlers tend to come to the surface when temperatures are between 60 and 70°F. In much warmer or cooler temperatures, worms remain below ground. Also, hunting worms during foggy conditions can be productive. Avoid searching in high grass. If you touch the grass it will act as an alarm to nightcrawlers, causing them to retreat into their holes. Working areas of flat dirt or low grass will be much more successful. Worms can detect white light from a normal flashlight and will withdraw quickly when hits them. On the other hand, they do not notice red light. Using a flashlight with a red lens will allow you to grab the nightcrawlers undetected. Try using a headlamp to keep both hands free. Carry a bag of fine sawdust with you and coat your hands generously and regularly with it. This will allow you to hold on to slippery nightcrawlers more effectively. Alternately, try using rubber gloves. Use a light touch when extracting a nightcrawler from its hole. Nightcrawlers usually do not come completely out of their holes, but simply rest on the surface with their tails still underground. This allows them to slip back in quickly when alarmed. When trying to extract a nightcrawler from its hole, use a gentle and steady tension on the worm. This will extract the worm from the hole without breaking it. Use a bucket to collect the nightcrawlers as you catch them. Do not overfill the bucket with nightcrawlers, as this can injure and smother worms at the bottom of the bucket. Empty your bucket into storage containers regularly to keep your nightcrawlers alive and lively. 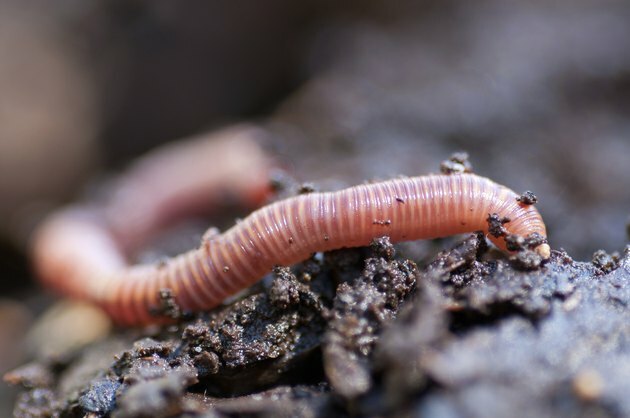 Store your nightcrawlers in a plastic or Styrofoam container with tiny holes in the top that will allow excess moisture to escape but will keep the worms in the container. Do not overfill the container with worms. Use a bedding of garden soil, coffee grounds and shredded dead leaves with enough water added to moisten the mixture. Store your worms in the refrigerator to keep them alive.